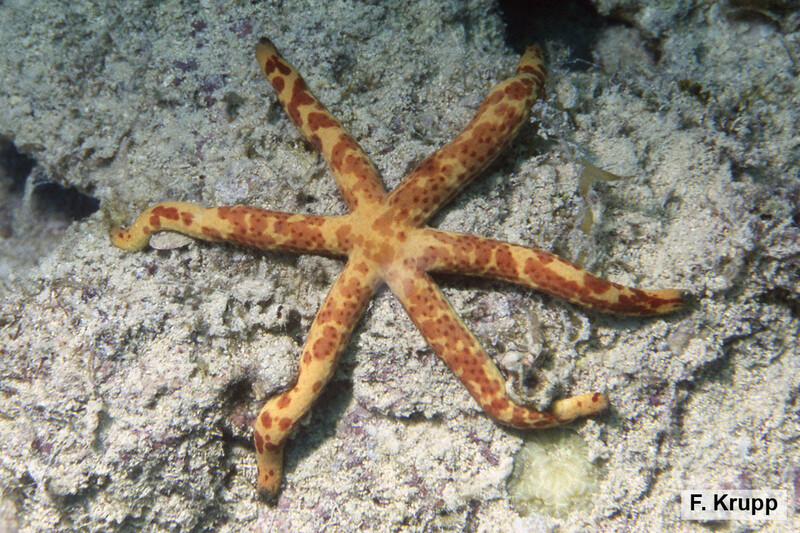 This species lives in or near coral assemblages on consolidated substrates, sand, or coral rubble, usually at depths of 5 – 10 m, preferring coarse sediments. It is usually cryptic, being often found under rocks. Its strong propensity to autotomize and its capacity to regenerate are remarkable. It feeds on dead fish and other animal tissues. The Common Comet Star is a cosmopolitan species in tropical seas, occurring in the Pacific, Indian, and Atlantic Oceans. In the tropical Indo-West Pacific, it is found in south-eastern Arabia, the Arabian Gulf, southern and Southeast Asia, Australia, the South Pacific Islands and Hawaii. Linckia guildingi has not yet been assessed for the IUCN Red List of Threatened Species. Linckia guildingi is characterized by a small disk, 4 – 6 (mostly 5) long, thin, cylindrical arms, and two or more madreporites. The arms are of unequal lengths. The upper body surface appears smooth, but it is in fact rough to the touch, with low, firm nodules. The species’ color is extremely variable, and usually juveniles and adults have different colors. Juveniles have brown, red or violet spots, while adults are uniformly reddish brown, yellowish brown, violet, or olive-green.